You'll be £4.99 closer to your next £10.00 credit when you purchase Battle of the River Plate. What's this? 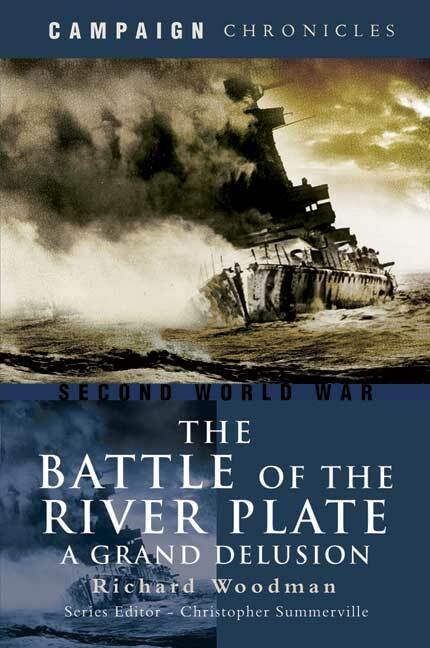 The Battle of the River Plate was the first major naval confrontation of the Second World War, and it is one of the most famous. The dramatic sea fight between the German pocket battleship Admiral Graf Spee and the British cruisers Exeter, Ajax and Achilles off the coast of South America caught the imagination in December 1939. Over the last 60 years the episode has come to be seen as one of the classics of naval warfare. Yet the accepted interpretation of events has perhaps been taken for granted and is ripe for reassessment, and that is one of the aims of Richard Woodman's enthralling new study. propaganda coup for Great Britain and the Commonwealth. As such, there was inevitably some development of myth. The author has produced a very readable review of the action that reassesses the event. Highly recommended. ...this author has made it all so very riveting, it really is a book which is hard to put down until finished. RICHARD WOODMAN, the well known seaman and writer, is an Elder Brethren of Trinity House, and is perhaps best known for his Nathaniel Drinkwater series of historical naval novels. He has written a considerable body of naval history including acclaimed studies of the Arctic and Malta convoys of the Second World War.